One of those, a bit forgotten, places is hippodrome, a horse racecourse stadium, a few kilometers north from the centre. It can be reached by city bus, bicycle or by car and offers a bit of nature and some horses. But don’t expect to see many people there. On the tribunes there is a bar with a big terrace – on the sunny side or in the shade – but what I prefer is to sit on the grassy tribune of the hippodrome watching people training with horses. 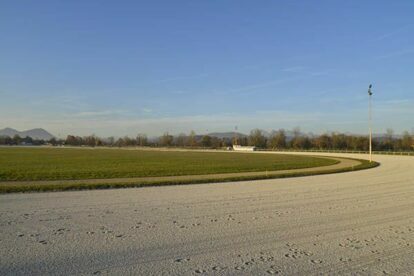 The view over the track is just the beginning, behind it there is a beautiful panoramic view over Kamnik – Savinja Alps. Hippodrome is also the place where really big events are held, like the mass by Pope John Paul II in 1996. Once we were even expecting Madonna and Michael Jackson to perform here, but unfortunately both shows were canceled. But there are always some trotting events during warmer months.